Maryland started 2018 on a good note, taking two out of three over the weekend at Tennessee. Head Coach Rob Vaughn picked up his first career victory Friday in a 4-0 win, and the Terrapins won the first game Sunday, 10-4, but failed to complete the sweep, falling in the final game Sunday, 13-6. Nevertheless, Maryland starts the season at least 2-1 for the first time since 2015, and now looks to pick up another road win Wednesday at 4 p.m. against William & Mary in Williamsburg, Virginia. It will be the first of two meetings between the two squads this season, as they play a home-and-home series for the second straight year. Last year, the Terps won both contests – a 9-8 victory in College Park on March 7 and a 6-0 win in Williamsburg on April 19. Unlike the Terps, the Tribe (0-4) did not have a good opening weekend, getting swept at Clemson to start off the 2018 campaign and losing at home to VCU on Tuesday. All four of their losses, however, have been by one run. William & Mary is without three of its five best hitters from a year ago. Ryder Miconi, who led the Tribe with nine homers and 45 RBIs in 2017, graduated last year, as did Charlie Ameer, who hit .284 with seven homers and 33 RBIs last spring. Infielder Cullen Large, who paced the team in average (.338) and hits (76) in 2017 is gone as well, after being selected by Toronto in the 5th round of the MLB Draft. The Terps will be glad to see the departure of these three, who went 6-for-14 with three RBIs last year’s meeting in College Park. The Tribe do return two top bats from a year ago, however, in outfielders Ryan Hall and Brandon Raquet. Hall, now a senior, hit .308 with a team-best 17 doubles last season, and is already off to a hot start this spring, tallying a homer, two doubles and four RBIs against Clemson. Raquet earned Freshman All-American honors last year after slashing .337/.433/.506 in 51 contests. He didn’t do much for William & Mary over the weekend, going just 1-for-8 with an RBI, but nonetheless figures to be right in the middle of the Tribe offense this season. Also returning for the Tribe are outfielder Owen Socher (.323/.407/.394 in 39 games last spring) and infielder Kyle Wrighte (5 HR, 29 RBI last year), who homered against the Terps in 2017 but has not appeared yet this season. Catcher Hunter Smith, who posted a .269 average with six homers and five doubles last season, homered over the weekend at Clemson. With the departure of left-hander Nick Raquet (older brother of Tribe outfielder Brandon) and right-handers Daniel Powers and Nick Brown, the Tribe pitching staff also takes on a new look this spring. Left-hander Bodie Sheehan is the only remaining arm from last year’s weekend rotation, and they need to replace Brown, who led the team with eight saves a year ago. Sophomore right-hander Wade Strain is the Tribe’s leading reliever so far this spring, making two appearances spanning a team-high 2.2 innings with one earned run allowed. Senior right-handers Charlie Fletcher and Robert White both return to the William & Mary bullpen this spring. Fletcher led the team with 30 appearances a year ago, pitching to a 3.14 ERA in 28.2 innings of work. His first outing of 2018 was rough, however, as the Ashburn, Virginia, native surrendered three earned runs in 1.2 innings of work. White made 21 appearances in 2017, but posted a 4.76 ERA and a lofty 2.16 WHIP. In 1.1 innings over the weekend, White did not allow a run. For Maryland, the offense clicked immediately this season, scoring 20 runs in three contests at Tennessee. Preseason Third-Team All-American Nick Dunn has lived up to the hype so far, going 4-for-10 with four runs scored and four walks over the weekend. He hit three home runs in Knoxville after hitting six total across the first two years of his collegiate career. Newly minted leadoff hitter Marty Costes is 4-for-13 with a homer, two doubles and four RBIs. Transfer Taylor Wright and freshman Randy Bednar also look good early, each hitting over .300 through three games. Kevin Biondic and John Murphy have each pitched two scoreless frames out of the bullpen for the Terps. Lefty Billy Phillips threw a scoreless inning out of the bullpen Sunday, his first collegiate pitches after recovering from leukemia. 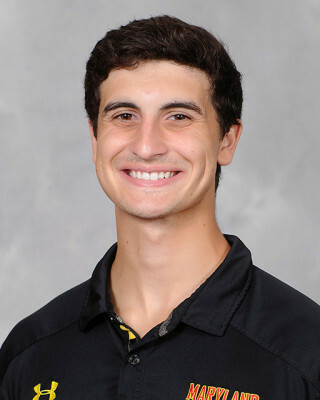 Freshman right-hander Mark DiLuia, who was originally slotted to start Wednesday, leads the Terps with 3.2 innings of relief, albeit with a lofty 9.82 ERA. Sophomore Elliot Zoellner will get the ball for Maryland in Williamsburg, making his first career start. The right-hander, nicknamed “Fuzz,” has made one relief appearance this season, allowing a run in 1.1 innings in the second game of the season at Tennessee. He gave up a hit and walked two batters in that appearance, but also notched his first career strikeout. His only other career appearance came early in last season at LSU. William & Mary has not announced a starter for Wednesday’s game.